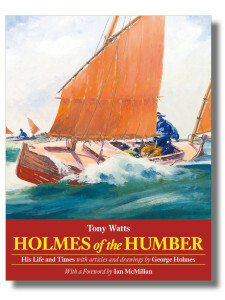 Holmes of the Humber is back! Yes, the book which launched Lode­star Books in 2009 is back in print in a high-qual­ity soft­cov­er edi­tion. Described as ‘A won­der­ful volume’ by Jenny Ben­nett at Wooden­Boat magazine in her three-page review of the first edi­tion, the beau­ti­fully illus­trated Holmes prom­ises you many hours of vicari­ous cruis­ing in the UK and main­land Europe, in the com­pany of this great sail­or, design­er, writer and artist (and ‘fath­er of the canoe yawl’), in a time and a soci­ety far removed from our own.